Some plants, more than others, have the potential to turn unsuspecting plant lovers into addicts. Orchids are known to do that. Just read Susan Orlean’s The Orchid Thief or Eric Hansen’s Orchid Fever, both probing the depths (or lows) to which orchid collectors will go in order to obtain the rarest of the rare. Cycads fall in the same category, something I wasn’t aware of until recently. For 10+ years, I’d been patiently watching my sago palm (Cycas revoluta) grow at a snail’s pace, but that had been the extent of my exposure to cycads. In late December I re-visited the University of California Botanical Garden at Berkeley, and somehow I ended up focusing on the many cycads they have. The Encephalartos species were particularly impressive with their often fantastical leaves, twisting and recurved, sometimes armed with sharp edges and spines—not to mention the almost otherworldly steely blue color of certain species. When I got home, I poked around online to see where I might be able to buy a couple of plants. While I found several cycad nurseries in California, seeing their price list almost gave me a heart attack. As I read some more, I began to understand why prices are so high: These are plants that grow incredibly slowly and seed is often hard to come by. Producing a sellable seedling can already take several years! Typically, cycads are sold by the diameter of the caudex, the woody base or trunk. The price of a sago palm (Cycas revoluta), by far the most common cycad in cultivation and by far the cheapest, with a 2-inch caudex (maybe 2 years old) might be $30. But a 5-inch caudex (5-7 years old) might cost $70, and a 10-inch caudex (10-15 years) $200. In contrast, an Encephalartos horridus, a rare and sought-after blue cycad from South Africa, might cost $300 for a 2-inch caudex, $750 for a 5-inch caudex, and thousands of dollars for a 10-inch caudex. It appears there is a thriving cycad subculture, with tales of theft, smuggling, and obsession. 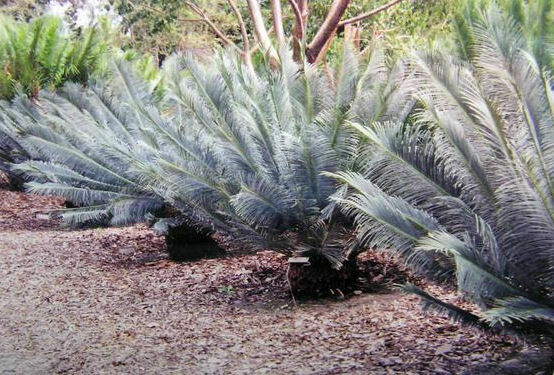 It is now illegal to import wild-collected cycads, but unscrupulous dealers often try to bypass the system. This article from the New York Times reads like the plot of a bizarre crime novel. I realized that the only way I could ever afford a more uncommon cycad was to get a seedling or small plant and simply wait for it to grow. That’s exactly what I did. I ordered four small plants, each with a caudex under one inch, and they arrived the other day. Two of the four are Encephalartos ferox seedlings. Two Encephalartos ferox seedlings. The one on the right is the regular type with flat leaves, the one on the left is a variety with wavier leaves from the town of Chiputo in Mozambique. They were both $8.40 each on sale at A&A Cycads so I got one of each. Look at the taproot of this Encephalartos ferox seedling! It’s massive compared to the size of the leaves. The other two are an Encephalartos longifolius x horridus hybrid, and a Cycas panzhihuaensis seedling. Based on the information I received from the sellers, I planted the new arrivals in pure perlite (the two Encephalartos ferox) and pure pumice (the other two). No real reasoning behind the choice of perlite vs. pumice; I just wanted to give both media a try. The goal is to use a very fast-draining medium to prevent rot that might otherwise enter through broken roots. As extra insurance, I watered thoroughly with a fungicide solution. Although all four plants are hardy in our climate, I’m pampering them for the time being, bringing them inside on nights below freezing. I will plant them in my fast-draining succulent mix later in spring. I wish I could say that I’ll have an update for you in a few months, but these plants are such slow growers that I don’t expect much to happen for a while. But I’ll be ready with my camera when they produce their next flush of leaves. And in 20 years I might have specimens that are as impressive as what I saw at UC Berkeley Botanical Garden. P.S. One of the most impressive cycad collections in the country is at Lotusland, the 37-acre estate of the late opera diva Ganna Walska outside of Santa Barbara, CA. In addition to the cycad collection, Lotusland also has amazing cacti, succulent and other themed gardens. We’re planning a trip there this summer. I understand why you are enamoured by cycads. I can easily get into cycad collecting myself had if not for the limiting price tag of bigger specimens. Such is the price of a very slow growing plant. Great selection of 'investment' plants there Gerhard. Some cycad collectors say C. panzhihuaensis is the hardiest of the bunch. Macrozamias are worth adding to your list too! Excellent purchase! And I can't wait to hear all about your trip to Lotusland.